Summary: 1845. New York City forms its first police force. The great potato famine hits Ireland. These two seemingly disparate events will change New York City. Forever. Timothy Wilde tends bar near the Exchange, fantasizing about the day he has enough money to win the girl of his dreams. But when his dreams literally incinerate in a fire devastating downtown Manhattan, he finds himself disfigured, unemployed, and homeless. His older brother obtains Timothy a job in the newly minted NYPD, but he is highly skeptical of this new "police force." And he is less than thrilled that his new beat is the notoriously down-and-out Sixth Ward-at the border of Five Points, the world's most notorious slum. I don't know if you remember, but a few weeks ago, I posted my review for THE GODS OF GOTHAM by Lindsay Faye. I seriously loved this book and I have been recommending it to everyone I know! I am far from alone in my praise of this book. Maureen Corrigan of NPR raves that THE GODS OF GOTHAM is the “worthiest successor yet to Caleb Carr’s The Alienist. If you are interested, you can read her full piece here. 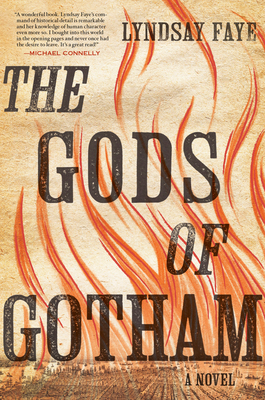 I am so excited that the fine folks at Penguin have offered an autographed copy of THE GODS OF GOTHAM to one lucky Booking Mama reader. To enter, just fill out the form below before April 15th at 11:59 p.m. ET. I will randomly select and notify the winner the following day. This contest is open to those of you with U.S. and Canada addresses only -- no p.o. boxes please. Good luck!